It has been suggested that Antony Dainan be merged into this article. (Discuss) Proposed since March 2019. The Twenty-Six Martyrs of Japan (日本二十六聖人, Nihon Nijūroku Seijin) were a group of Catholics who were executed by crucifixion on February 5, 1597, at Nagasaki. Their martyrdom is especially significant in the history of Catholic Church in Japan. A promising beginning to Catholic missions in Japan – perhaps as many as 300,000 Catholics by the end of the sixteenth century – met complications from competition between the missionary groups, political difficulty between Spain and Portugal, and factions within the government of Japan. Christianity was suppressed, and it was during this time that the 26 martyrs were executed. By 1630, Catholicism had been driven underground. When Christian missionaries returned to Japan 250 years later, they found a community of "hidden Catholics" that had survived underground. On August 15, 1549, the Jesuit fathers Francis Xavier (later canonized by Gregory XV in 1622), Cosme de Torres, and Juan Fernández arrived in Kagoshima, Japan, from Spain with hopes of bringing Catholicism to Japan. On September 29, St. Francis Xavier visited Shimazu Takahisa, the daimyō of Kagoshima, asking for permission to build the first Catholic mission in Japan. The daimyō agreed in hopes of creating a trade relationship with Europe. The shogunate and the imperial government at first supported the Catholic mission and the missionaries, thinking that they would reduce the power of the Buddhist monks, and help trade with Spain and Portugal. By the late 1500s, the government had begun to grow wary of foreign influence; the shogunate was also concerned about colonialism. The government increasingly saw Catholicism as a threat, and started persecuting Catholics. Christianity was banned and those Japanese who refused to abandon their faith were killed. The Christian martyrs of Nagasaki. 16-17th-century Japanese painting. Drawing remembering the 26 Catholic martyrs. In the aftermath of the San Felipe incident of 1596, on February 5, 1597, twenty-six Catholics – four Spaniards, one Mexican, one Portuguese from India (all of whom were Franciscan missionaries), three Japanese Jesuits, and seventeen Japanese members of the Third Order of St. Francis including three young boys – were executed by crucifixion in Nagasaki on the orders of Hideyoshi Toyotomi. These individuals were raised on crosses and then pierced through with spears. After the persecution of 1597, there were sporadic instances of martyrdom until 1614, in all about 70. On September 10, 1632, fifty-five Catholics were martyred in Nagasaki in what became known as the Great Genna Martyrdom. At this time Catholicism was officially outlawed. The Church remained without clergy and theological teaching disintegrated until the arrival of Western missionaries in the 19th century. Shūsaku Endō's acclaimed novel Silence, drawn from the oral histories of Japanese Catholic communities, provides detailed accounts of the persecution of Catholic communities and the suppression of the Church. While there were many more martyrs, the first 26 missionary and convert martyrs came to be especially revered, the most celebrated of whom was Paul Miki. The Martyrs of Japan were canonized by the Catholic Church on June 8, 1862, by Pope Pius IX, and are listed on the calendar as Sts. Paul Miki and his Companions, commemorated on February 6, since February 5, the date of their death, is the feast of St. Agatha. They were included in the General Roman Calendar for the first time in 1969. Previously they were honoured locally, but no special Mass for them was included even in the Missae pro aliquibus locis (Masses for some places) section of the 1962 Roman Missal. Some 21st-century publications based on it do have such a Mass under February 13. The Church of England also celebrates the Japanese martyrs liturgically on February 6. The Anglican Church in Japan (Nippon Sei Ko Kai), a member of the Anglican Communion, added them to its calendar in 1959 as an annual February 5 commemoration of all the martyrs of Japan. The Evangelical Lutheran Church in America added a commemoration on February 5 to their calendar. The Church of the Holy Japanese Martyrs (Civitavecchia, Italy) is a Catholic church dedicated to the 26 Martyrs of Nagasaki. It is decorated with artwork by Japanese artist Luke Hasegawa. Statue of Philip of Jesus in the Basilica of Our Lady of Zapopan. ^ "Martyrs List". Twenty-Six Martyrs Museum. Archived from the original on 2010-02-14. Retrieved 2010-01-10. ^ Delplace, Louis. "Japanese Martyrs." The Catholic Encyclopedia Vol. 9. New York: Robert Appleton Company, 1910. 29 March 2019 This article incorporates text from this source, which is in the public domain. ^ In the 1962 typical edition of the Roman Missal, page , the text goes directly from the Mass of St. Francis de Sales (January 29) to that of St. Margaret of Cortona (February 22). ^ The Daily Missal and Liturgical Manual. London: Baronius Press. 2008. pp. 1722–1723. ISBN 978-0-9545631-2-7. ^ The Roman Catholic Daily Missal. Kansas City, Missouri: Angelus Press. 2004. pp. 1637–1638. ISBN 1-892331-29-2. 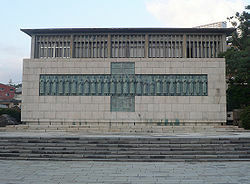 Wikimedia Commons has media related to Twenty-six Martyrs of Japan. This page was last edited on 29 March 2019, at 23:56 (UTC).